Rinse and then wilt the spinach. Finely chop and sweat the onions until soft. Place spinach, onions and ricotta in a food processor and blitz. Add grated nutmeg, salt and pepper to taste. Place the mixture in a piping bag and fill the dried cannelloni with the mixture. 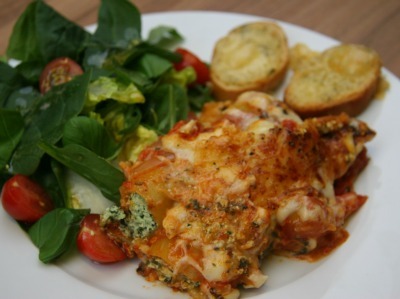 Put the filled cannelloni in a large lasagna dish or similar. Meanwhile, make your tomato sauce. Heat some olive oil and add your finely chopped garlic cloves and cook for 1 minute. Add your tinned tomatoes, balsamic vinegar and flat leaf parsley and simmer for 30 minutes. Once your tomato sauce is cooked, pour over the top of the cannelloni. To top the dish make a white sauce. Melt your butter and add the flour. Cook out the flour for five minutes and then add the milk little by little. Make sure the sauce is nice and thick and then add the grated cheddar. Place the cheese sauce on top of the tomato sauce and cook the dish for 45 minutes or until the cannelloni is cooked and the top is golden brown. Serve with a Sussex Marble crouton and green salad.